Electric Bidet seats might seem too expensive to some folks. Regardless, they don’t want to give up on a reliable cleansing system under a much more economical price. This is where non-electric bidet seats come in! These do not require any electricity and are quite easy to work with! 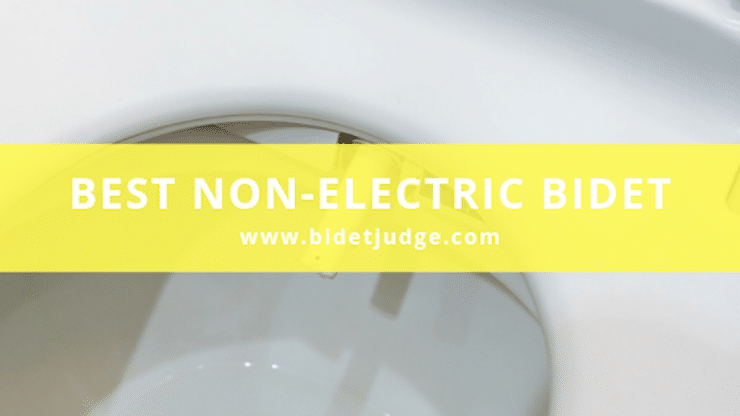 What Is Non-Electric Bidet Seat? Non-electric bidets make use of the water pressure in your pipe to operate. They are usually an inexpensive choice, generally priced under $100. Most of these bidets come with cold water as they do not have the electronics to heat up the water. However, most of these can tap into your regular hot water supply and ensure an ambient temperature water spray. The pressure and position of the spray can be adjusted easily through a lever, dial or a knob planted on the side of the seat. These are much more eco-friendly as well as they help in conserving water and reducing electric use. They can fit on any kind of toilet. Offer thorough and proper cleansing. Affordable in price, usually ranging from $50-$200. They are attached to the underside of the toilet seat. Do not have a learning curve as they are easy to use. Eco-friendly as they do not waste any energy. Sleeker and slimmer than the electric ones. No seat warming options are available. Water pressure and temperature cannot be adjusted. Does not warm up the water itself, instead uses hot water from the sink. Click to see other types of bidets available. Durable and sturdy, the Genie Bidet Seat can be your perfect partner for a luxurious, spa-like experience in your own bathroom. The non-electric bidet seat is designed to fit on most of the toilet models. The seat is elongated to accommodate folks of all sizes and shapes. 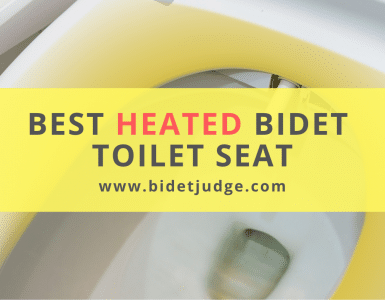 What we loved about the Genie Bidet Seat is the high adjustability. The spray can easily be adjusted from very soft and gentle to strong and cleansing, depending on your preferences. The futuristic design features a nozzle that extends from under the toilet seat with the press of a button. To ensure proper cleaning, the device features two nozzles: one for feminine washing and the other for rear cleaning. The temperature of the wash cannot be adjusted, however, it is always at an ambient temperature. This ensures you get a gentler wash with an aerated stream of flowing water! Apart from that, the Soft Close lid ensures your experience stays quiet through the night. In terms of design, the low 2 3/8 inches modern clean design is sufficient to provide you with the best cleanse. Let’s talk about the installation next. Installing the hardware was quite simple and easy because you only need to attach it to a water pipe. The unit is quite safe as well because it has no electric wiring. This makes this non-electric toilet much easier to use since you don’t need to learn all the functions. This is why the Genie Bidet Seat is best for the guest bathroom! Easier to use and simple to install. Comes with two extendable nozzles. Features a wide variety of spray patterns. The angle of the front water spray can be too wide. 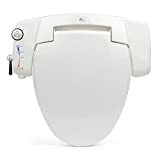 Chuck all those expensive electric bidet models when you can have this affordable yet highly functional Kohler Puretide Bidet Toilet Seat. 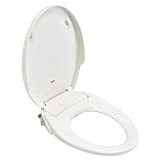 The toilet seat operates using an easy to use lever that you can push down or up manually. These seats don’t require any electric power or batteries which makes them much safer. Also included is a premium built single wand that provides warm water for thorough cleansing. What’s unique is the wand automatically cleanses itself after each use so it stays neat and clean. The spray [position can be adjusted easily by a side handle so you never miss. Even the pressure can be adjusted according to what the user prefers. All you have to do is push down on the wand and the spray will change from posterior to anterior type. Turning the wand left or right is the perfect way to control the pressure. Furthermore, the seat has been ergonomically designed in a way that promotes comfort as well as a sleek, elegant look! The Puretide is perhaps the best non-electric bidet due to its durability and adjustability. Moreover, it includes the Quick Close technology that allows you to close the seat quietly yet quickly without slamming it. The Grip tight bumpers ensure a perfect, secure fit! The wand can be used for better adjustability of sprays. Offers anterior as well as posterior cleansing. The toilet seat is very grippy. Takes time to secure the bidet hose with the seat. The toilet seat doesn’t seem to fit everyone. 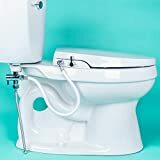 If you’re looking for the best non-electric bidet seat for elongated toilets, then look no further! The BioBidet is a premium bidet installation that is as functional as it is luxurious. The bidet is equipped with their patented vortex nozzle system. This ensures better cleaning and that no solid build-ups are left behind. This is not only referring to the solid waste, but also to the lime and calcium scale deposits that are often found inside toilets. There are two different nozzles, one for a feminine and the other for posterior wash. The nozzle can be easily controlled by you through the joystick controls. So far, the other joysticks we have seen have been simple and easy to use. This one is quite complex. It can serve to adjust pressures as well as temperatures. The nozzle has a self-cleaning function as well, which will make it easy for you to clean. We found that the installation part of the Bio Bidet was quite easy since there was no wiring installed. All we needed to do was connect the bidet hose to a water connection. What’s more unique about the Bio Bidet s the feminine soap reservoir! It is the first and only bidet to feature a soap dispenser for feminine wash. Through this, you get the perfect therapeutic and spa-like experience all in the comfort of your own bathroom. Comes equipped with a soap dispenser for feminine washes. Adjustable pressures, positions and temperatures. The nozzle is easy to clean. Vortex System ensures no solid buildup. The bidet doesn’t actively heat water itself. Whether you’re looking for a more affordable option for comfortable cleaning or just generally interested in a luxurious experience, the American Standard Aqua Wash will serve you well. 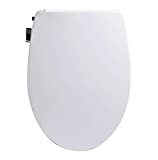 Right off the bat, the non-electric bidet seat has a sleek and slim design that fits right in with all kinds of décor. The seamless design makes it easier to conceal the toilet bowl ring. It includes a detachable nozzle as well. The spray patterns can be easily adjusted to what you like and prefer. The nozzle is equipped with a self-cleaning function so you don’t have to waste time trying to get deposits off it. Also for easier cleaning is the on-button lift off feature that allows the toilet seat to come off with the press of a button. The American standard Non-electric bidet seat is constructed out of durable propylene plastic which means it will last you much longer. Worried about having to hire a plumber to install this seat? Well, the installation is quite easy and the unit comes with everything you need including mounting hardware, water supply, and adaptor. So, you can easily do this on your own. TO ensure a quieter close, the AquqWash Manual Seat is equipped with slow-close hinges. This ensures you can easily close the lid without slamming it. All in all, these are one of the best non-electric bidet seats with respect to durability. Modern and sleek design that successfully hides rings. All mounting hardware comes with the package. Features Quick-close and pressure adjustability. Connections can be easily threaded out. No male or female spray settings. The Alpha V2 bidet seat is designed to keep things simple and easy, all at an extremely affordable price. However, don’t be fooled! The Alphas comes with the same quality as one of the high-end brands. The modern design features a low profile for easier sitting. The toilet seat is just 2.4 inches tall at the back. Luckily, there are no huge attachments under the seat either like you would find in most electric versions. The adjustable spray patterns ensure that you can effectively perform a thorough cleansing. The ambient temperature spray will ensure you’re not shocked in the mornings with cold water! Moreover, the nozzle is retractable and can be used for both front and rear cleaning. The best part about the Alpha is that it is easy to install. It doesn’t need a qualified plumber t do the job! Instead, you could probably do it yourself in about 20 minutes as it doesn’t involve any electric or more complicated plumbing connections. What’s more is the high-quality internal brass valves, brass inlets, brass t-valve as well as the braided metal hose. These allow for better durability and increase the longevity of the non-electric bidet toilet seat. When compared to the rest with plastic parts, you can definitely see why the Alpha V2 is more popular. The durability and the longevity of the alpha V2 are no doubt unparalleled and are perhaps only outshine by its ease of installation. Robust metal parts for longevity. Low profile toilet for a more modern look. Features an Ambient temperature water spray. Provides effective and thorough cleansing. The seat may be too small for larger folks. Nozzle retraction may be a little flimsy. The Brondell Ecoseat is built with nothing but the environment in mind. These non-electric bidet seats not only reduce paper waste, but they also reduce the amount of electricity used as well. The nozzles on this bidet are solely powered by the water pressure. The bidet is actually controlled by a smooth jog dial which makes it easy to control the bidet. The dial can be used to easily control the water pressure to your preference. Aerated water shoots out to the nozzle is either of two forms: posterior or feminine wash spray. Aerated water is yet another eco-friendly feature of this bidet. Since the water is mixed with bubbles of air, this ultimately results in lesser water. Of course, aerated water spray has more comfort applications as well, because it can easily convert high pressurized streams to gentle fountains Apart from this, the Swash Ecoseat also features a nano silver ceramic sterilizing wash inside the filter. This ensures that every flush of water, your toilet not looks clean, but is sanitized and free of all pathogens. All in all, the Brondell eco seat is quite easy to use and control. You can easily close the lid with the Gentle-closing lid feature without having to touch the toilet seat itself. In fact, the toilet seat itself features the gentle closing spec as well. Easy to control dial with multiple preference settings. Aerated water streams for a gentle cleansing. Features a gentle-closing lid and seat. Controls are a bit delayed. Tends to leak a bit, according to some users. See also other best Brondell bidets. The Bio Bidet A5 Stream is perfect for all those who want an affordable bidet but, refuse to compromise on the quality. The Bio Bidet A5 Stream is built to last you for a long time. Quality materials, as well as premium design, ensures that it is the last man standing amongst its competitors. The brass and metallic components completely leave the others in the dust! A huge evidence of the durability is how strong the lid is. You can easily sit on top of the lid without the fear of breaking it. The bidet seat is very compact as well. It measures only about 4 inches at the back whereas conventional seats can easily reach 8 inches. The retractable dual nozzle allows for a thorough cleanse as well. You can easily retract it back and prevent kids from playing with it. The bidet features two different pressure washes including a posterior and a feminine wash. 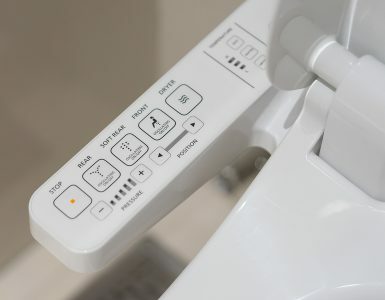 The bidet is easily controlled by a control lever that is attached to the side of the seat. The A5 has design, performance, quality, and affordability all in one package, providing you with maximum results. Strong lids that can be sat upon. Works only for smaller sized folks. The knob can be a little stiff to turn sometimes. All in all, the best non-electric bidet seats are very economical as well as environmentally friendly. Most of them provide you with multiple adjustment options. Best of all, most of them are compact and streamlined when compared to the huge bulky electric ones. So, if you want an easy to use bidet that does not rack up on your electric bill, we believe non-electric is the way to go!